Screenplays are a very formal type of writing with a highly specific format and rules. This is because they are not just a way to tell a story, they are blueprints for making a movie. Sure, spec scripts are sometimes more sales tools than blueprints – designed to interest executives, directors, and cast in making the film. But they still have to look like a plan for production of a movie. After all, that’s the ultimate goal. With this in mind, today I want to focus on what the screenwriter must do when they open a scene. I read many scripts that fail to do this properly. Let’s start with the very first part of the scene: the slug line. First, I should address when you need a new slug line. It can be more complicated than it seems. The simple answer is that you need a new slug line any time the location changes or there is a jump in time. This indicates a new scene. Occasionally, this can get tricky. What if the characters are walking from the bedroom of their house to the living room, talking continuously? Is this a new scene? In order to make these decisions, it’s important to understand the purpose of a slug line. The slug line is really there to help the production manager schedule the shoot. Movies are often shot out of order. The production manager decides which scenes to shoot on which days, and they identify these scenes by slug line. So any time the crew might move to a new set, there should be a new slug line. Since the bedroom and the living room might actually be in different locations, moving from one to the other indicates a new scene. Part one is whether they are interior (INT.) or exterior (EXT.). Again, this is to help the production manager decide whether they require a location or could be built on a soundstage. Sometimes, of course, exterior locations are built on soundstages and interiors are shot on location, but this is not the screenwriter’s concern. There is also a designation (I/E.) for when the scene takes place both inside and outside at the same time, such as someone looking out their window into the yard. Next is the location. Try to call the same location by the same name throughout the script. This not only makes the production manager’s job easier, it makes it easier for the reader to follow the script. So don’t call a single location SAM’S DINER in one scene, DINER in another scene, and THE COFFEE SHOP in a third scene. Finally, slug lines indicate whether it is a day shoot (DAY) or night shoot (NIGHT). Again, this is for scheduling. Sometimes writers get cute here and say something like MORNING or 3 P.M. But how will we know what time of day it is on screen? Besides, like I said, the real purpose of the slug line is scheduling, and all the production manager cares about is whether it’s day or night. It is acceptable to use CONTINUOUS if we are moving from one location to another without a break in the action. And if you must, you can identify SUNSET or SUNRISE or GOLDEN HOUR – just be aware you are making the crew’s job hard, since they will have to film the scene in a very limited time frame! You may read some scripts that don’t follow all the rules for slug lines. Perhaps they drop DAY at the end of the slug line until they change to NIGHT, for example. In a selling script, you might get away with that (it will be fixed for the shooting script). But if you are not an established screenwriter, I recommend sticking to proper slug lines. It shows that you know what you’re doing. Don’t repeat information that’s in the slug line. If the slug line is INT. ITALIAN RESTAURANT – NIGHT, you don’t need to start your scene with, “Fatimah is sitting in an Italian restaurant. Don’t describe everything in the room. Instead, pick one or two details that give the reader (and the production designer) the flavor of the setting. Be specific. Like almost anything else in writing, specific is better than general or vague. Alicia enters with a tray of used breakfast dishes. She loads the dishwasher. How did Dan like his breakfast? Good. I told you that recipe would work. I still think you should have made French toast. As you read along, you might be thinking, “Wait, where did Kim come from? Wait, Steve’s there too? Who else is in this kitchen?” The scene may be clear in the writer's head, but the reader will feel confused, and if it’s someone to whom you’re trying to sell your screenplay, you’ve probably just lost that sale. Always establish all the characters in the room at the start of the scene, and indicate when someone comes and goes. This goes for unusual objects, too. If at some point in the above scene Kim uses a toaster, the reader won’t think twice. But if she hops on a riding lawnmower, the reader will be thoroughly confused. If there’s a riding lawnmower in the kitchen, you need to tell us up front! Arthur and Ali enter the locker room. Various boys are showering, changing, snapping towels at each other. Arthur and Ali make their way to their lockers. Begin changing. A skinny sophomore approaches. This is HOWARD. Do you guys have any extra clothes? Since you’ve established there are other boys in the locker room, there is no need to specifically mention Howard until he becomes important. When your polishing your last draft, it pays to ensure your scene openings follow these guidelines. It will help the reader follow your story and show that you know how a screenplay works. And if your film should go to production, the production manager will be very grateful! 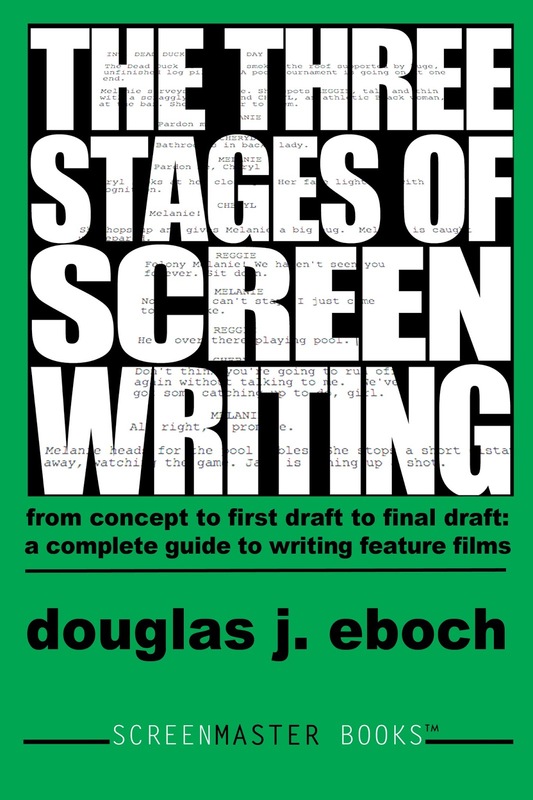 In my book, The Three Stages of Screenwriting, I describe what I refer to as the “Dramatic Question” of the story. This is the question that is asked by the Catalyst (also known as the Inciting Incident) and answered in the Resolution. At its most basic, the question is some form of: “Will the main character achieve their goal?” This question defines the scope of your story. On an unconscious level, the Catalyst lets the audience know what the plot is about by posing this question. The audience knows the story will be over when they get the answer. The Dramatic Question relates to plot. When I ask my students to define the Dramatic Question of their screenplays, they sometimes give me an answer along the lines of: “Will Keisha overcome her fear of intimacy?” Now, this could possibly be the Dramatic Question of a story, but usually this kind of internal question relates to the character arc, not the plot. Other times a student will give me an answer like: “Is humanity worth saving?” This is also not really a Dramatic Question. It’s a thematic question. I demand the students form their Dramatic Questions in relation to the plot because they will be using this question to structure their story. The act breaks and other structural beats will be related to this question. Since this is film, it’s important to make it external and measurable. And I encourage questions with a yes or no answer because it’s easier to figure out what should be happening at each structural beat. One of the films I use as an example in The Three Stages of Screenwriting is Gravity (written by Alfonso & Jonas Cuaron). The Dramatic Question in that movie is “Can Ryan make it back to Earth?” This is a good dramatic question that drives the plot, and the movie ends when we get the answer. So let’s consider what the other questions would be and try to determine how they work in the story. The Character Question in Gravity would probably be: “Can Ryan find the will to survive?” This question is set up when Ryan tells Matt about the death of her daughter. We see that she has lost her reason for living. This happens in the beginning of act two. It comes to a head near the Second Act Turning Point when Ryan decides to give up and turns off the oxygen in her capsule. It is resolved when she has her vision of Matt and he asks if she wants to live or die. She chooses life, and figures out how to solve her problem. This coincides with the Epiphany stage of the structure. Building from this, I would say the Thematic Question of Gravity is: “What keeps us going in the face of death and danger?” Though there is an answer to this question in the story, I will note that this is not a yes or no question. Perhaps that is what makes a thematic question different than the other types of questions. Maybe good Thematic Questions have more complicated answers. The Thematic Question of Little Miss Sunshine has to do with winning and losing. Richard’s first words are, “There are two kinds of people in the world, winners and losers.” And when deciding whether to take Olive to the pageant, Richard asks her if she thinks she can win, because, “there’s no point in entering a contest unless you think you can win.” The themes of winning and losing are set up early in the script. And near the Midpoint, Olive confides in her grandfather that she fears Richard won’t love her if she doesn’t win. Of course, in the end she doesn’t win… but Richard has realized it’s more important to support his daughter no matter what. And that reveals the Character Question of Little Miss Sunshine: “Will Richard support his daughter even if she doesn’t win?” And of course the answer there is “Yes.” Here that character question is established at the Catalyst and again answered at the Epiphany when Richard jumps up on stage to join Olive in her crazy dance. I realize I never proposed an actual Thematic Question for Little Miss Sunshine. Let’s go with: “What is more important – being a winner or having people who love you?” You might notice that all of the subplots about the supporting characters involve that question in some way. Exploring the theme is a common use for subplots. So from these two examples, the Character Question seems to be important to the Epiphany of the film. This makes sense. We want the character arc to affect the plot, and the plot to cause the character to change. And the Thematic Question seems to be the result of what it means to place this specific character in this specific plot. As you may gather, I don’t yet have a fully formed theory about these three questions. But I will be watching for them in movies I study in the future, trying to figure out how they work. Stay tuned… there will be future posts on this topic!